I drive into Las Vegas to get their payment sorted, ready for when the barn is done in case it is done by Sunday when my bank isn’t open. I hate to go in. The sun is out but I know the road is not yet dry. And sure enough it is still horrible. I have to go off-road in a couple of spots, nearly getting lost on Trigg land and leave telltale tracks in the grass. But I finally get off the mesa, dash into town, to the bank and post office, and back up the mesa, fearful of the clouds blowing up fast over the land. I make it back. 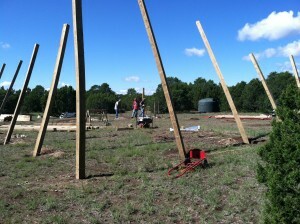 The crew has finished digging the holes and now set the poles, standing them upright, filling around the base of each. They are deep in the ground. At sunset I stand on the road and look into the site. 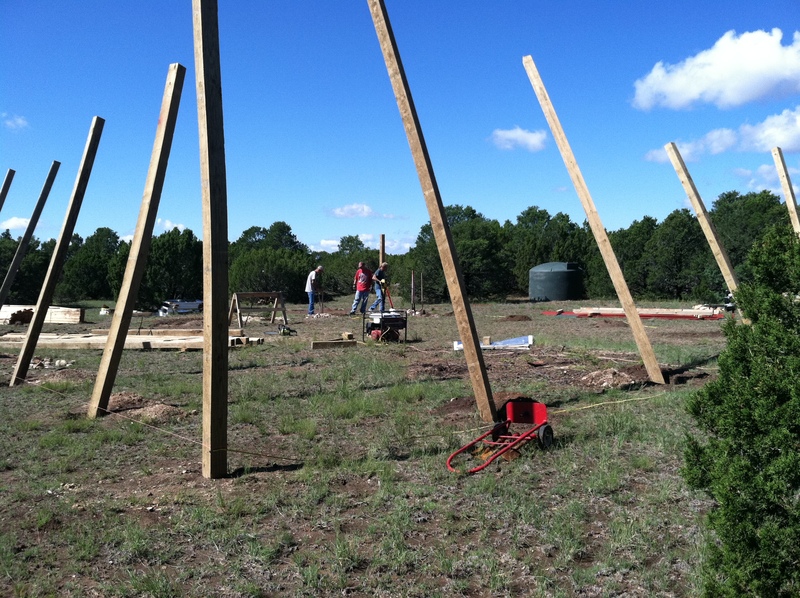 All the poles are set, standing vertically now, every ten feet. They ring the full footprint, like Stonehenge. Like a temple. I feel a surge of joy. I walk into the site. 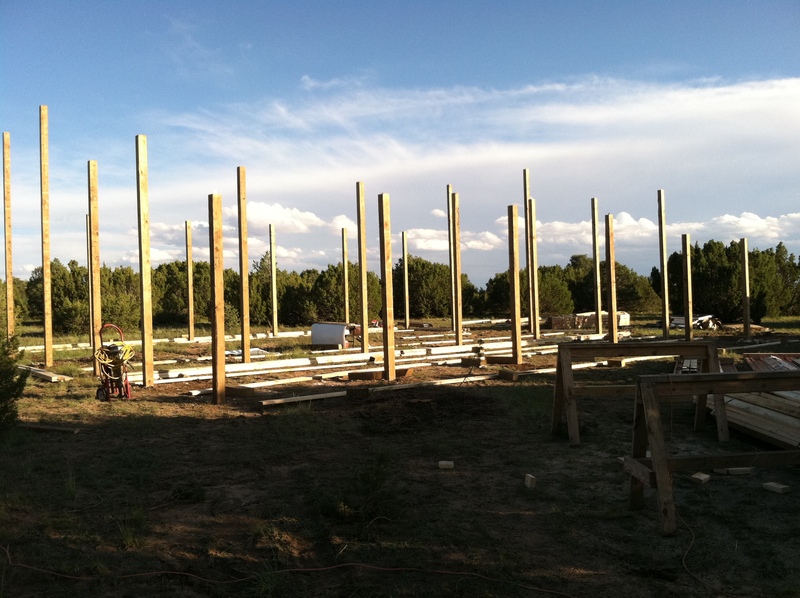 The 2X6 lumber that will form the wall supports lie along the ground delineating where the walls will be. Jackhammer, sawhorses, shovels, hammers, saws litter the enclosed space. Despite this, I see the dance space; it is a beautiful dimension. I can see that the shed will be perfect for a sleeping room on the SW corner and a summer kitchen with a long wooden table toward the NW for people to eat and prepare meals, or just sit and talk. I see where the slide doors will open in the back, and which tree I will prune a bit so it grows into a shade tree like the one on Rocky’s land beside what used to be the stone schoolhouse form the Depression era. I turn and look and pace around in the golden late afternoon light. A home for my work. Looking forward to doing a retreat here. Your writing reminds me how much I miss them. So exciting. Please keep showing us pictures! How exciting! Thank you for sharing this stage of your journey. Will there be a barn-warming? Of course! 😉 And some fleshing out. The barn us skin and bones; it’ll need flesh and some bottom. I envision part if that as a community project. So thrilling. So happy for you. Finally, a home! Dunya, Sheer beauty! 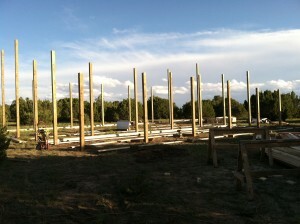 It makes my heart soar to see the standing supports rising to the heavens. I think the Stonehenge day was very beautiful. 😉 it is quite awesome. The final pics are coming up. I love a dance barn. a home for my work…..beautifully put…..